This article is about the area of Castle Volkihar used by the Volkihar vampire clan. 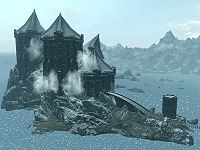 For the dungeon area of the castle, see Castle Volkihar. Volkihar Keep is the home of the Volkihar vampire clan in Skyrim, located at Castle Volkihar on an island far west of Solitude. Though you can travel to the island immediately upon installing the Dawnguard add-on, the keep is initially inaccessible. You must work with the Dawnguard vampire hunters for a short time in order to gain entry, even if you wish to side with the Volkihar vampire clan during the add-on's main questline. Once you locate Serana, she tells you to take her here. After reaching the island, you will be able to gain entrance to the keep by crossing the bridge connecting to the island. On your first visit, she will stop you on the bridge to say a few words before the watchman standing guard will open the gate to the keep. Outside the keep, there is little of note besides the bone hawks circling the castle. Throughout the inside of the keep are a large number of bookcases (all fully stocked), as well some various poisonous flowers in planters scattered around. Some of the keep is destroyed, making certain areas inaccessible, though the path to the courtyard (located at the back end of the top floor) may be repaired after completing Dawnguard's main questline on the Volkihar side by talking to Garan Marethi. This repair is free of charge and is completed the next time you enter the keep. * The presence of these people in this location is affected by quests and/or player choices in gameplay. Dining Hall: This is generally where most NPCs can be found if they aren't in their usual location. The only loot of note is three Potions of Blood, one on each table, and multiple portions of Human Flesh. As with all items in the keep, these will respawn after ten days outside the castle. Smith: Fura Bloodmouth and Hestla can usually be found here, the former attacking the dummies and the latter working in the smithing area. There are the usual smithing amenities, including a grindstone, workbench, tanning rack, and forge, though it lacks a smelter. The four weapon racks around the room each contain one leveled weapon. The forge area itself contains a few iron ingots, steel ingots, gold ore, a copy of The Aetherium Wars, two weapon plaques above the forge (one with an iron warhammer, the other a leveled sword), and miscellaneous smithing items. At the southern end is a small archery range with two Imperial bows mounted behind the stand and various arrows lying around. There are two coffin areas, one to the north end and one to the south end, both of which contain minor loot around them. Chalice Room: This room holds the Bloodstone Chalice, which, if you drink from it while a vampire, will allow your Vampiric Drain spell to also absorb magicka and stamina for the duration of the effect (which is lengthened every time you bring an Ancient Vampire body part back). As well, there are two bottles of skooma and an iron dagger on a table. Lab: Feran Sadri and Ronthil can both be usually found here working on the first floor, and Garan Marethi can be found on the second. Harkon frequents the first floor as well. On the first floor, an alchemy lab can be found, as well as two glass cases containing alchemy ingredients—one containing poisons and a Frenzy poison recipe—and a shelf containing other various ingredients. Ronthil can sometimes be found sleeping on the floor behind one of the turned bookcases. On the second floor is an arcane enchanter and two locked glass cases—one containing a black soul gem, and the other with one of each soul gem except grand and an Elven Dagger of Binding. On the balcony overlooking the dining hall, another copy of The Aetherium Wars can be found, as well as a set of Vampire Armor and boots on a shelf just behind the balcony. There is also a coffin near here that Garan Marethi frequently uses. Coffin Room: Leading from the first to the second floor of the lab is a small room containing eight coffins, two weapon racks to one end, and some clothing to the other. On the side opposite the weapon racks are four Vampire Armors (two gray, one light gray, one red), two pairs of Vampire Boots, and a locked glass case with two regular unenchanted amulets and a Bone Hawk amulet. This location is where most of the less important vampires of the keep sleep, as well as those who work in the alchemy section of the lab. Harkon's Quarters: Frequented by Harkon, the torture room contains a bloody rack, a throne and chair facing the fire, a large empty cage near the chairs, and a coffin in the back of the room. There is a werewolf pelt in the case to the immediate right of the door, and various poisons, embalming tools, and a woodcutter's axe are on the table near the rack. On a shelf above the display and book cases are two samples each (a total of four plants) deathbell and nightshade. Further up, there are four locked glass cases on the left wall containing, from left to right, a Bone Hawk amulet, Bone Hawk ring, and a diamond in the first; an enchanted necklace in the second; a leveled scroll in the third; and four human hearts in the last. There is a common soul gem, a Potion of Blood, and a scroll, and another case with a Dragon Priest dagger in it across from the first four cases. Going through the door in the rear leads to his personal coffin room, containing a coffin, a leveled weapon on the rack to the left of the coffin, and a plate to the right of the coffin with gold and gems inside. Up the stairs further north, there's a chest under the table which is safe for storage. Strangely, there is Mythic Dawn tapestry hanging above the torture rack. 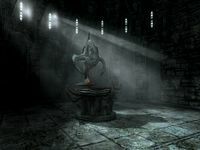 Serana's Room: This room was originally owned by Serana, and is derelict until the completion of The Bloodstone Chalice. No one seems to enter it at any point, including Serana herself, possibly because her bed is erroneously marked as belonging to Valerica. There is an arcane enchanter and an alchemy lab in the southwest corner, as well as a few potions and soul gems around them. In the northwest part of the room there is a small closet containing a wardrobe and two locked glass cases: one with two unenchanted necklaces, the other with an enchanted dagger and an unenchanted ring. Also scattered around the room are various planters and pots containing different types of assorted flora, as well a minor loot around the two nightstands flanking the bed. Kitchen: After passing through a small corridor with kegs of dripping blood in it is the kitchen. There is little of note here aside minor items and a blooding rack, as well as a coffin usually used by Rargal Thrallmaster. On the east side of the room, there are three sacks; the one to the left is not safe for storage, but the other two (the blood-splattered ones) are. Thrall Pen: Further past the kitchen is the thrall pen. Before going down the stairs you can find the uncommon tavern clothes on a wardrobe to the left, along with various other low-value apparel. Down the stairs, you'll find two large cages, each with three Vampire Cattle inside. These Cattle have no dialogue options, and when selected have the option of feeding on them with no adverse side effects. 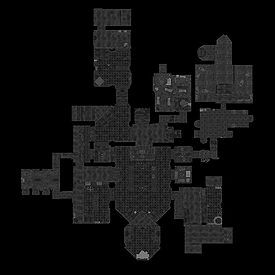 The cathedral is a room attached to the northwest of the keep, unused aside from the related quests. There is an unusable shrine to Molag Bal at the apex of the room, with two staircases leading to raised platforms on each side. Harkon brings you here at the end of Bloodline if you choose to become a Vampire Lord, at which time a Vampire Cattle stands near the door. The final battle also occurs here during the Kindred Judgment quest. It is generally quite bare, with a chest by the door containing minor leveled loot appearing during Kindred Judgement. Two versions of the cathedral exist; one is actually part of the same cell as the rest of the keep, the other is a separate cell that is used for the battle in Kindred Judgement. The door leading to the separate cell is positioned in front of the regular door and permanently remains in place after the quest, rendering the regular cathedral inaccessible without use of the console. All wardrobes and bookcases within the keep are safe for storage. Unless otherwise noted, other containers respawn after ten days with the rest of the keep. With 38 of the 41 containers being safe for storage, all regular crafting amenities except a smelter, and three merchants available within the keep, this location can be ideal for use as a home if you side with the Volkihar vampire clan. Serana's room will only be furnished after completing The Bloodstone Chalice. Committing a crime in Volkihar Keep will increase your Whiterun bounty. If you lose your vampirism after siding with the Volkihar vampires in the Dawnguard questline, NPCs in the keep will refuse to speak to you until you have Lord Harkon or Serana change you back. However, you are not required to become a Vampire Lord again; being a regular vampire will work. All NPCs will behave the same regardless of your type. If you have allied with the Volkihar vampire clan, Dawnguard scouts occasionally appear near the fast travel arrival point to the castle. The inside of the keep will respawn after ten days. This can be specifically beneficial to vampire characters who did not side with the Volkihar, as it allows access to four respawning Potions of Blood. There is one on each table in the main dining room, and another in Harkon's quarters. However, these potions will have to be stolen in order to be taken. If you have joined the Dawnguard, all the bodies of named NPCs (except Lord Harkon) killed during Kindred Judgment will never disappear. Taking things from the Keep will count as stealing even when you've completed Kindred Judgment siding with the Dawnguard. This page was last modified on 17 January 2019, at 10:07.